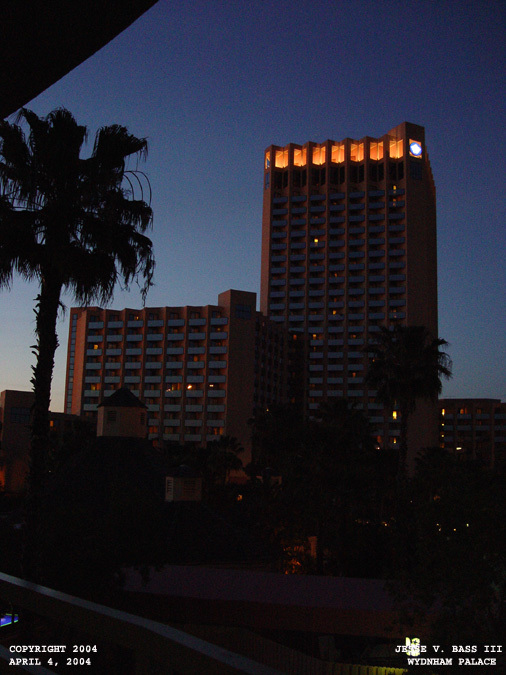 We arrived in Orlando at our hotel the Wyndham Palace late in the evening of April 4th. We made plans to go to Disney a few days before the opening session on Wednesday. 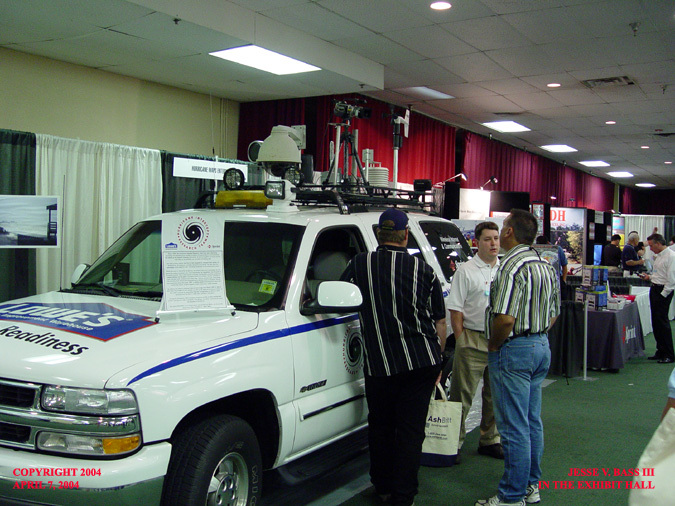 Our plans were big for the conference this year as we planned on putting the Chevy Tahoe inside the exhibit hall for the conference for the first time. We sat in on some of the chat sessions with the forecasters from the NHC and one of the sessions with Steve Lyons and the NHC Director Max Mayfield. 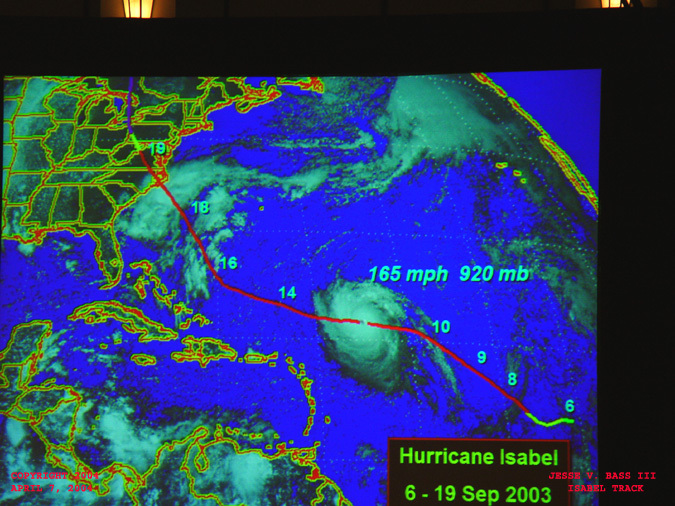 The big talk this conference was of course Hurricane Isabel that effected the North Carolina and Virginia coasts in a big way. 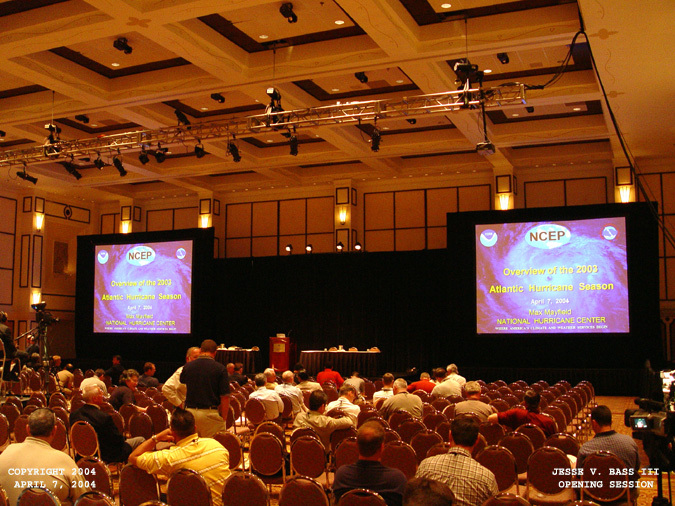 What would the conference hold this year? Well at the end of the conference when Bill Gray made his predictions for the 2004 season, we did not expect one of his predictions to come to pass so quickly. 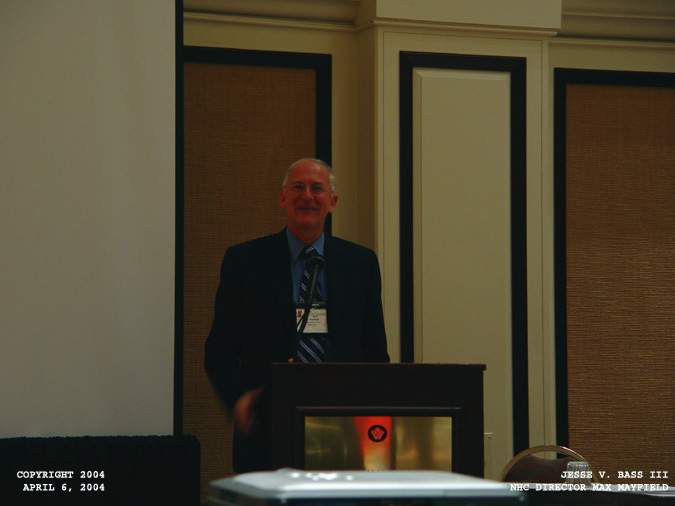 To a room full of conference goers, he made the statement that "Florida's good luck could not and would not continue." The state has been lucky in dodging the onslaught of increased hurricane activity since 1995. By the end of the 2004 season, that prediction was dead on with 4 major hurricanes effecting the state starting with category 4 Hurricane Charley. Below are photos and a description of each through our week at the conference and trip home as we stopped by a school in Florida to put on a presentation. This is a photo of the main hotel, The Wyndham Palace. We were in a smaller wing of the hotel out behind the pool. This made for a great webcam pic through the week at HurricaneTrack.com. 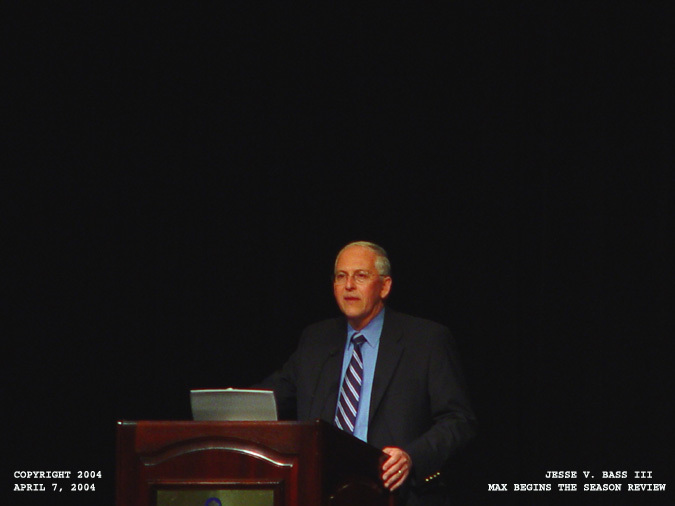 This was one of the opening sessions of the conference. 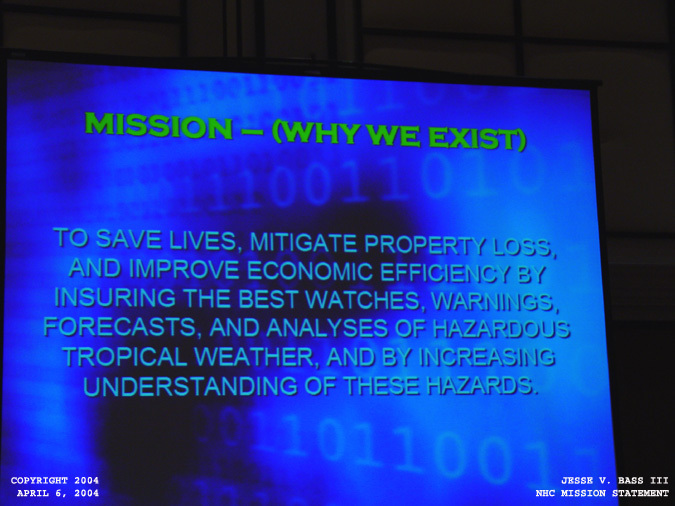 Here you can read the mission statement from the National Hurricane Center and NOAA. This was a class given to help improve relations between the NHC and HRD and the media. This is a graphic that was shown during a session with the director of the NHC, Max Mayfield and The Weather Channel's tropical expert, Steve Lyons. 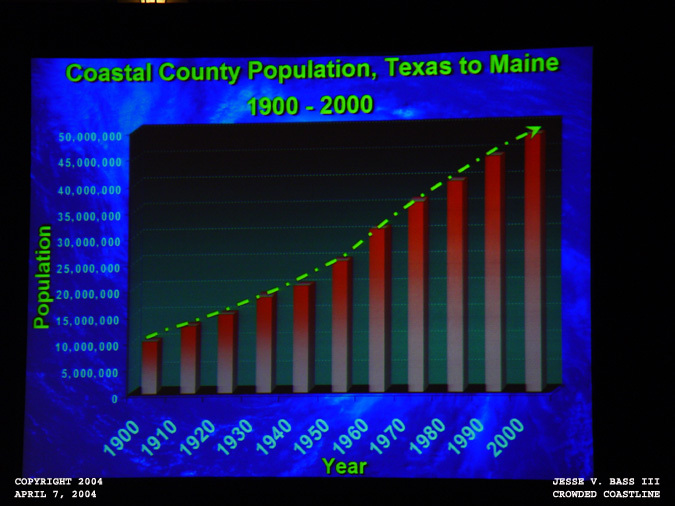 Here you can see how the population along the coastal areas has increased over the past 100 years. Here you can see a slide of a hurricane's deadly foe. 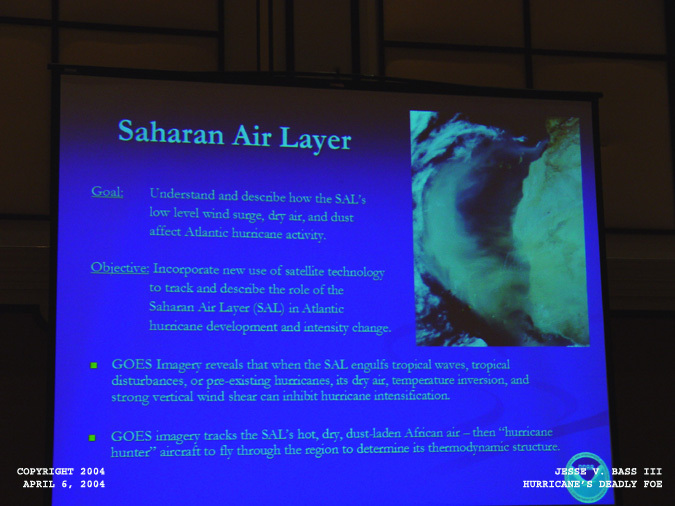 This is the Saharan Air Layer or SAL. Large amounts of sand and dust get blown into the air with some of the larger tropical waves that come off the African west coast. This SAL can inhibit development of the systems by depleting the warm moist air. 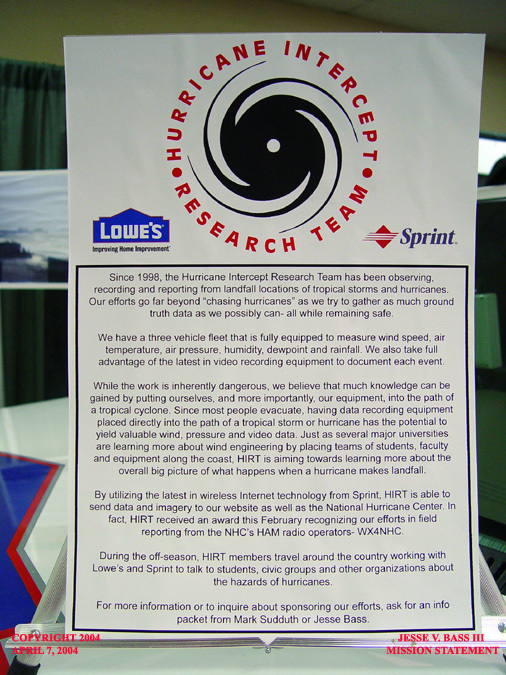 It dries the air out and without the moisture, a hurricane cannot develop. 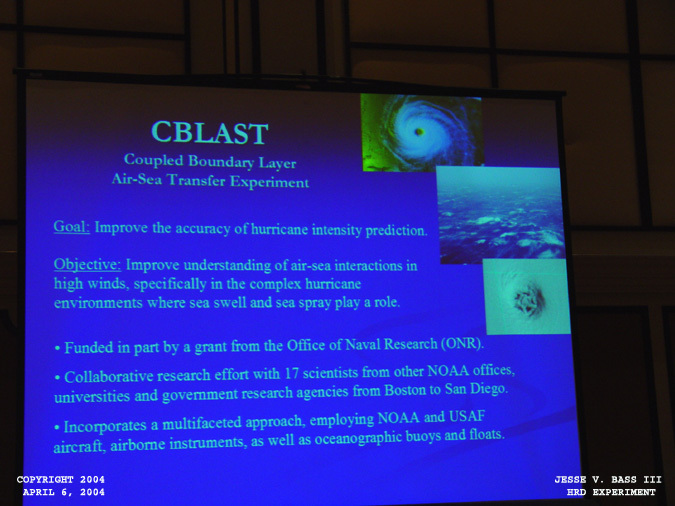 This photo is a discussion of the CBlast project which is a HRD, Hurricane Research Division experiment. NHC director Max Mayfield in a "rap session" with Steve Lyons. Here Max was taking a question on the 5 day forecast and its accuracy in 2003. 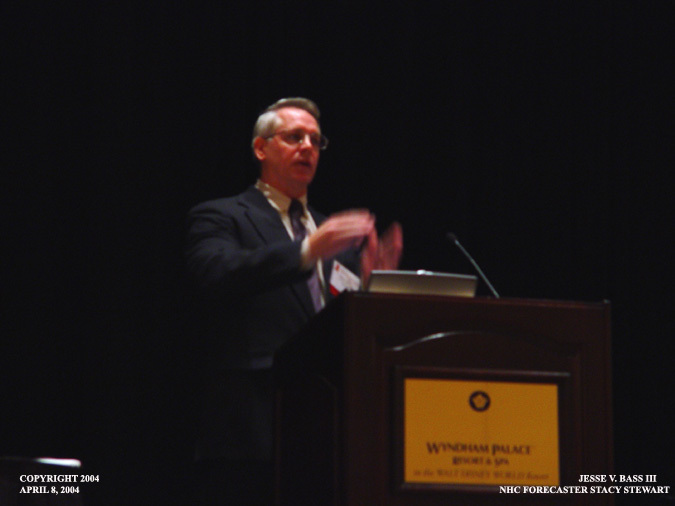 Max Mayfield begins the 2003 Atlantic hurricane season review. 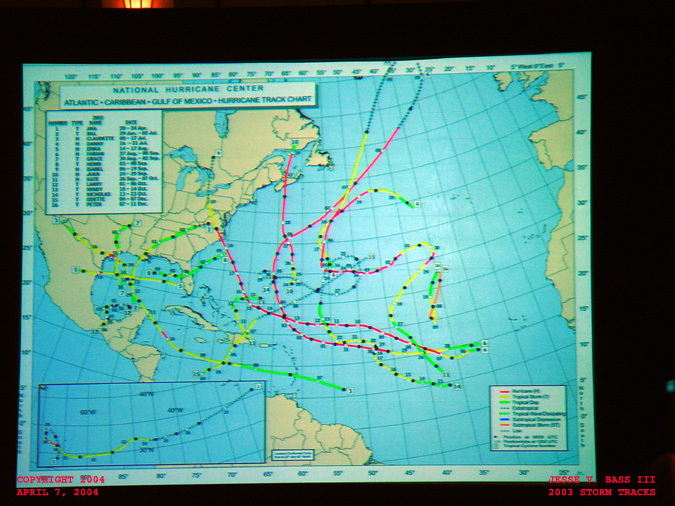 This photo shows all of the named storms for 2003. Also, you can see which ones reached hurricane status, their minimum central pressure and the maximum sustained winds. 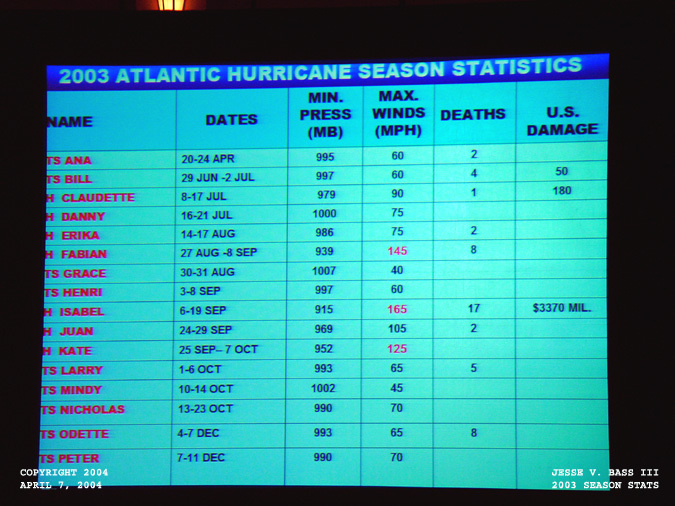 As you can see in the red text, we had 3 major hurricanes in 2003, one of which was Hurricane Isabel. Here is a graphic of all the 2003 storms and their tracks. Looks like the landfall threat to the U.S. coastline was a reason to worry. 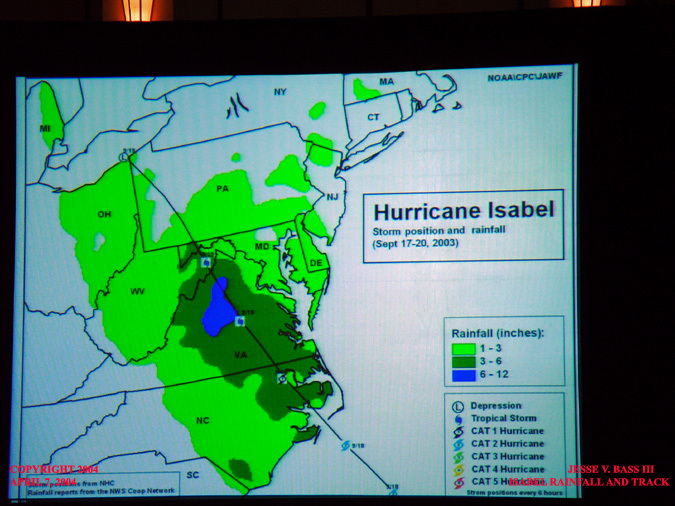 Here you can see 5 landfalls, one being Hurricane Isabel. As you could guess, a lot of time was spent on Isabel. This photo shows her when she was at her peak intensity. 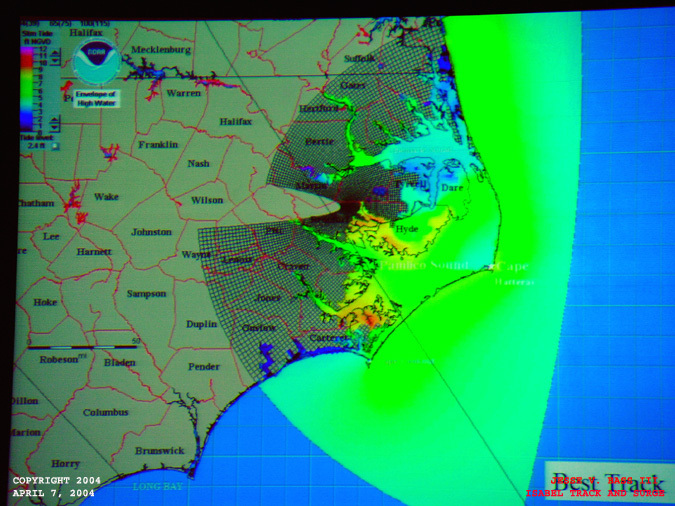 And here you can see Isabel's landfall area, track and the storm surge amounts along the North Carolina and Virginia coastlines. Max discussed the threat of storm surge and this photo shows the power of water. Several reporters were out during the storm and felt threatened by the surge so they called 911. The National Guard went out to rescue the reporters in this duce and 1/2 when the surge washed it off the road and rolled it. Everyone survived. Isabel's track and rainfall swath. Here is H.I.R.T. 's mission statement. We were setting up our booth for display in the exhibit hall during the conference. This year, the Chevy Tahoe was the booth. 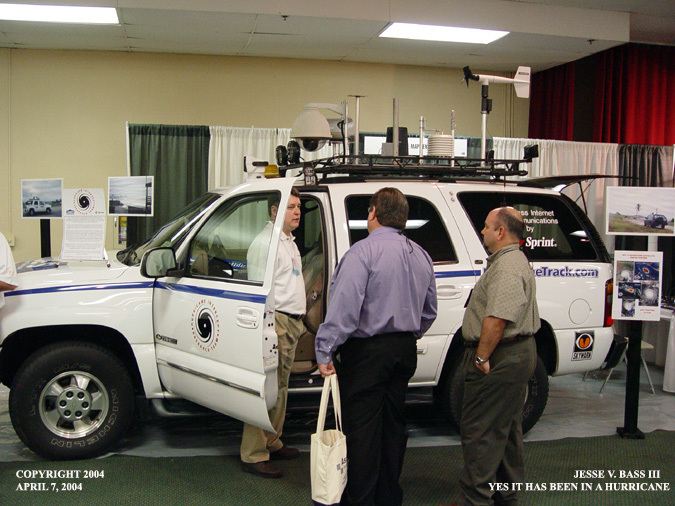 Once the exhibit hall opened, it was time to talk to everyone interested in what we do before, during and after a hurricane. 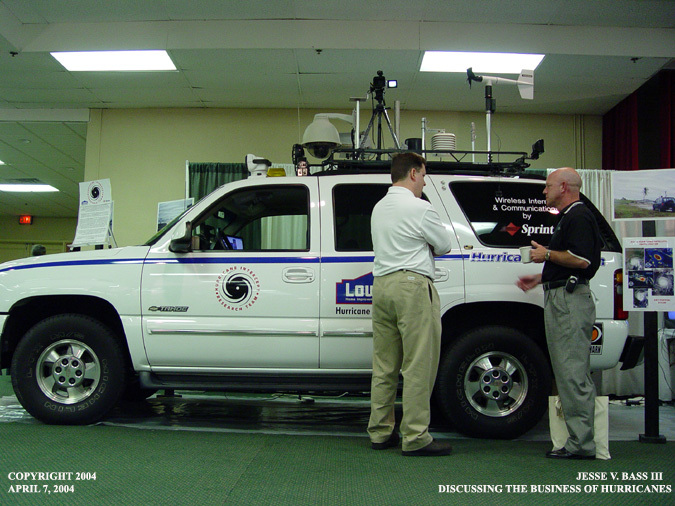 Here Mark Sudduth is telling several gentlemen what all the equipment is and does on the roof of the vehicle. 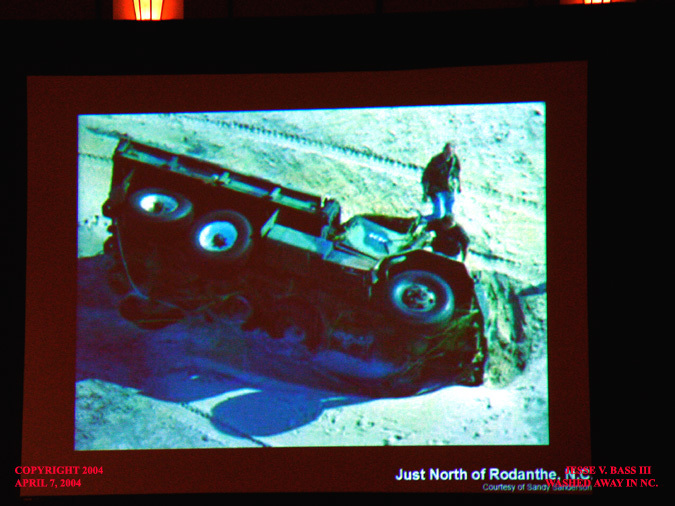 Here Mark is showing several people the setup inside the vehicle. Here he was talking about our sponsorship with Sprint and how they provide us with the wireless communications we use while on the road. The laptop was up and running with the Orlando local radar. The Tahoe was a big success and plenty of people stopped by to see the setup. Many people asked the question, "Where can I buy one of these?" 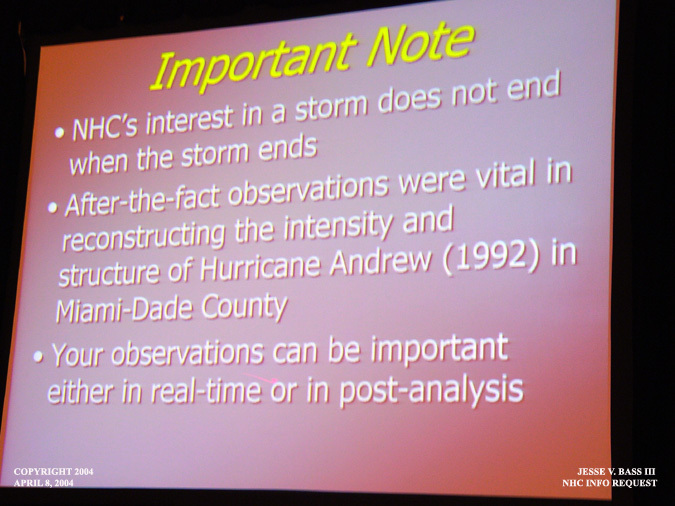 One of the the other classes I sat in on was several of the NHC forecasters talking about hurricane computer models, intensity and track. Here Stacy Stewart was talking about the storm structure of a hurricane. 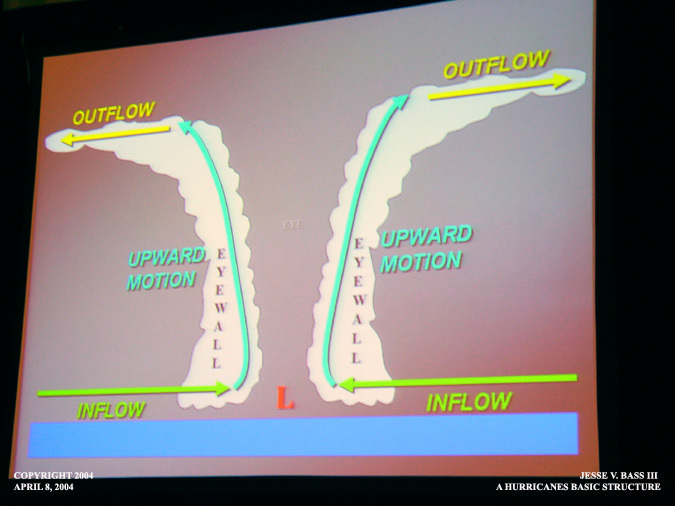 Basic diagram of the storm structure of a well developed hurricane. Here the NHC is asking for any information you can provide, during or after the storm. 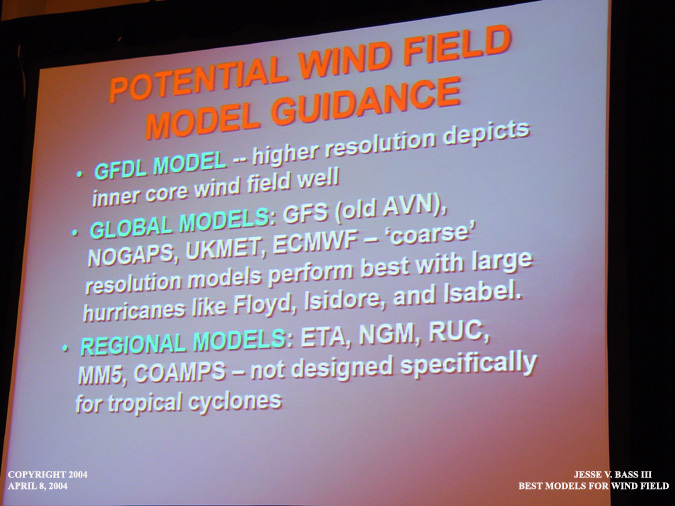 And here is a slide of which models perform best in certain cases.